How to play the Brexit referendum (published February 29, 2016): Setting up for a trade? In addition, Tadas Viskanta at Abnormal Returns made a compilation of blogger wisdom about smart beta, which includes my contribution (see The dirty little secret behind smart beta investing). There’s lots of good stuff there. The consensus seems to be that while smart beta funds and ETFs have their uses, they are no magic bullets and investors have to understand exactly what they’re getting into when they buy. I had suggested that traders may want to watch the EWU (UK ETF) vs. FEZ (Euro STOXX 50 ETF) as a way of playing the Brexit referendum. Currently, this pair is roughly in the middle of the trading range (also note that since these ETFs trade in USD, this pair already factors in any currency effects). The Brexit leave campaign announcement that it had gathered the backing of 250 executives, including former HSBC CEO Michael Geoghagen. Traders may wish to take a speculative position of shorting EWU against buying FEZ in anticipation of further short-term gains by the Leave side, until the pain gets enough that the Project Panic Stay campaign can scare convince the British electorate to vote to remain in the EU. A generational low in oil and energy? OK, my past headline that oil and energy stocks was likely seeing a generational low was probably an exaggeration, but the publication timing of that call was fortunate and the trade has worked out quite well so far. The lower panel shows that the market relative performance of energy stocks is in the process of testing an uptrend, which remains intact. 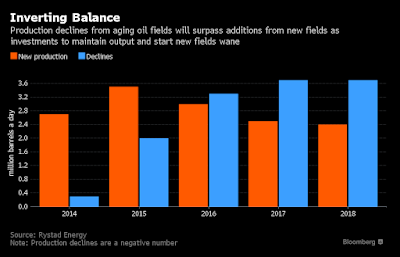 About 3 million barrels a day will come from new projects this year, compared with 3.3 million lost from established fields, according to Oslo-based Rystad Energy AS. 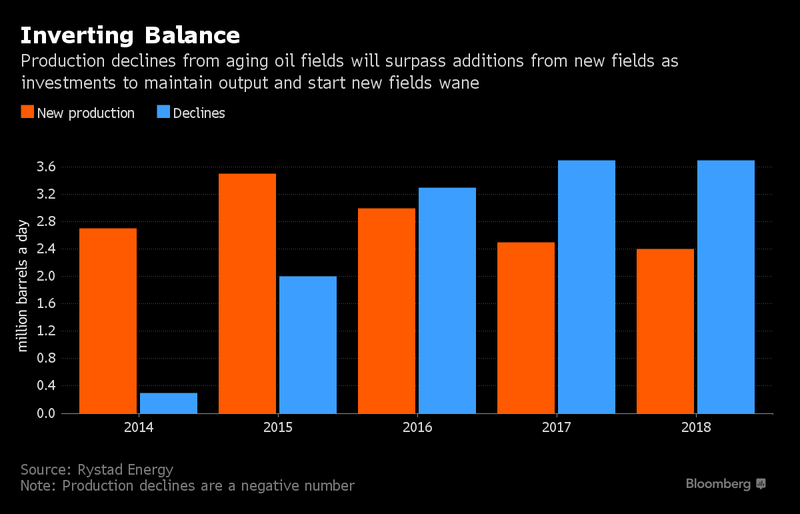 By 2017, the decline will outstrip new output by 1.2 million barrels as investment cuts made during the oil rout start to take effect. That trend is expected to worsen. In the short-term, however, the latest EIA report shows that inventories rose to another record level, which continues to spook traders. Watch for more analysis like the Rystad report to become more mainstream – and that should serve to push oil prices and energy stocks higher later this year. Once again, we saw buying pressure completely dominate selling pressure via the uptick/downtick measures. This lifted the cumulative uptick/downtick measure to new highs (see below). As noted yesterday, volume has not been stellar (though it picked up yesterday), but what volume has been there has been strongly skewed to the buyers and that has been associated historically with favorable near-term returns (upside momentum). In addition, sentiment models indicate a high level of skepticism, which suggests that the market is likely to continue to climb the proverbial Wall of Worry. 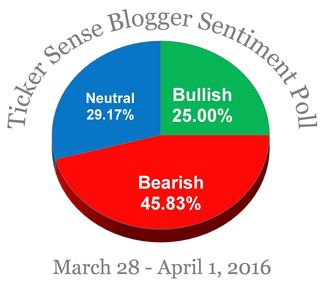 As stocks recovered dramatically from its February lows, it is curious that the latest Tickersense Blogger Sentiment Poll shows that the number of bears exceeding bulls (I was one of the few bulls in the last poll). Similarly, the latest AAII poll shows a remarkable low level of bulls. As the chart below shows, AAII bulls are nowhere near crowded long levels despite the recent rally and even fall short of the readings seen at the market highs seen last November. At a minimum, such high levels of skepticism sets up an environment of low expectations, where good news will have maximal bullish impact and bad news minimal bearish impact. Barring some totally unexpected surprise, it suggests that we have not seen the highs for this rally and any weakness is likely to be mild. My base case scenario calls for a grind higher to test the old all-time highs. The crowd needs to get more bullish and the bears need some form of capitulation.